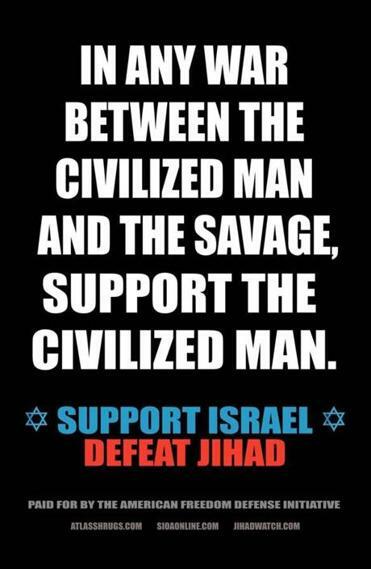 A pro-Israel group sought to place this ad on MBTA trains. Officials with the Massachusetts Bay Transportation Authority rejected the ad in November on the basis that it violated the agency’s advertising guidelines, which include rejecting advertisements that demean and disparage individuals and groups, promote alcohol or tobacco, and depict graphic violence. MBTA general manager Beverly A. Scott said in a statement that the agency is “gratified” by Gorton’s decision. “We will continue to administer our guidelines evenhandedly, so that our customers will not be subjected to advertisements that demean or disparage any person or group,” the statement said. While the MBTA applauded the ruling, lawyers for the nonprofit did not, saying an appeal is imminent. In response, the American Freedom Defense Initiative sought to put up 10 of its own ads in the same stations where the other posters appeared. In contrast, the Palestinian Refugee ad, the judge said, “conveys information that portrays Israel in a negative light” but does not violate the MBTA’s advertisement guideline, as a reasonable person may disagree or dislike it without finding it degrading or reproachful. “Thus, the question is not whether the advertisement upset some transit riders but instead whether a reasonably prudent person would find that it ‘ridicules or mocks, is abusive or hostile to, or debases the dignity and stature of Israelis or Jews,’ ” Gorton wrote.